The Church meets for Worship each Sunday at 11 AM from the first Sunday after Labor Day in September through the second Sunday in June, and at 10 AM for the summer weeks in between. There is Fellowship Hour immediately after worship each Sunday in the Colonial Room, which can be reached through the doors at the front of the Sanctuary. Please be our guest and enjoy our hospitality. The Lord’s Supper is observed on the first Sunday of each month. Special Celebrations are scheduled throughout the year. Among these are Ash Wednesday, Maundy Thursday, Good Friday and Christmas Eve services. All who are baptized and trust Jesus Christ as their savior are invited to partake. This invitation comes with a warning: if you sit down and eat with Jesus at this table, you will get up walking like Jesus and talking like Jesus. Anyone who is interested in providing flowers to decorate the Sanctuary during a worship service, whether in memory of someone or in celebration of someone, may do so by calling the church office for more information. 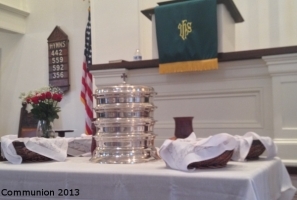 What our culture calls a “funeral” is in the Reformed Christian tradition more appropriately called “A service of Witness to the Resurrection.” If the service is to be held on the property of New Hempstead Presbyterian Church, it shall be under the jurisdiction of the Session of New Hempstead Presbyterian Church. Because the pastor (Teaching Elder) of the congregation is trained in Reformed Theology and Reformed Liturgical practice, s/he shall work with the family of the deceased to ensure that our Reformed tradition in upheld. 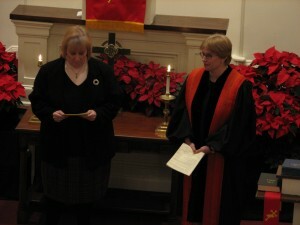 S/He shall be responsible for the order of service, in consultation with the family. For more information, see our Funeral Policy.